Austrian Michael Walchhofer topped the second training run for the men's Olympic alpine skiing downhill here on Thursday. More importantly for organisers, all but one of the 89 racers completed the run, meaning that Saturday's blue ribbon event can go ahead, one of the prerequisites being that all competitors must have skied the course at least once before the race itself. Walchhofer clocked 1min 34.46sec down the Dave Murray course, which was shortened because of training being run simultaneously with the women. It was also brought forward because of low-lying cloud and snow. Walchhofer, the reigning Olympic downhill silver medallist who also claimed world downhill gold in 2003 and super-G silver in the 2005 worlds in Bormio, said: "It's a good course for me. "It wasn't very important for me to have a second run because I've raced it four times." Home hopes for a podium placing, notably in the absence through injury of reigning world champion John Kucera, were buoyed by Robbie Dixon and Erik Guay posting good times. Dixon followed up on his second fastest time on Wednesday by repeating the feat with a second fastest of 1:34.55, while Guay was in third, 0.22sec off the pace. Jan Hudec and Manuel Osborne-Paradis also notched up impressive times to ensure the Canadian quartet will be a real threat to the traditional powerhouses of Austria and Switzerland come Saturday. American Steve Nyman tipped the Canucks for a medal showing, saying the fact they had trained on the course handed them an upper hand. "It was better than yesterday, smoother and cleaner," he said of the course. "But the Canadians have an advantage. They have been training here for a while which is a bummer for us but not for them." 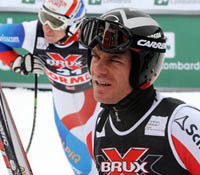 Swiss pair Ambrosini Hoffman and Didier Defago were fourth and fifth in the timings. Austrian Klaus Kroell, Aksel Lund Svindal of Norway and American Bode Miller also slipped into the top 10 and should be in the running for a podium push given that the course seems to favour the 'gliders'. The third downhill training run is slated to take place on Friday, with the actual race scheduled for Saturday morning. The downhill will be followed by the super-combined on February 16, the super-G (Feb 19), the giant slalom (Feb 21) and the slalom (Feb 27).